Meet Reddit user BourgeoisBanana. Like many people, he watched Quentin Tarantino's Django Unchained—a hyper violent Western film that deals with slavery. 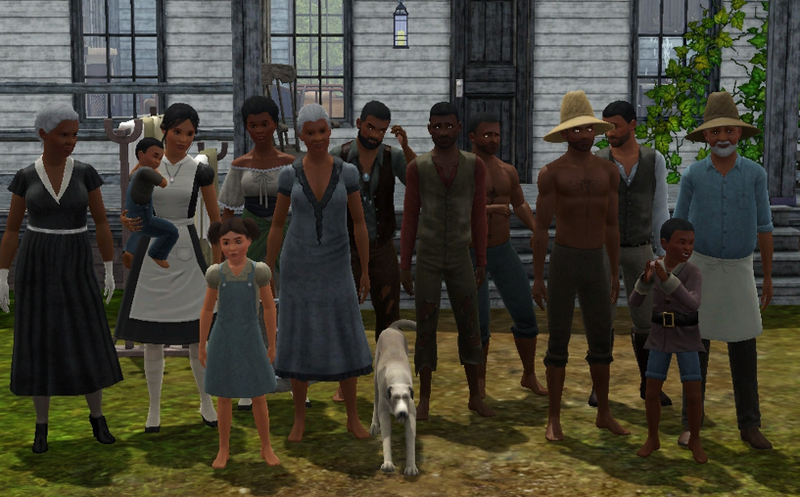 Unlike most people, the movie inspired BourgeoisBanana to recreate a colonial-era plantation in The Sims 3 according to PC Gamer—slaves and all. "After seeing Django Unchained, the idea sort of came to me," BourgeoisBanana explained. "My main inspiration for the exterior was the plantation house from a level in Hitman: Blood Money." Under normal circumstances, a 'faithful' colonial-era plantation recreation wouldn't be possible in The Sims 3, and so BourgeoisBanana had to resort to mods. Why do it in the first place, though? Boredom, apparently. The original Reddit thread, which is also crossposted in the 'I'm Going To Hell For This' subreddit, is where the creator said that boredom makes him do 'terrible things.' He also said that he's interested in both architecture and history, which the recreation let him explore. Nonetheless, BourgeoisBanana seems adamant about what his creation represents, stating that we shouldn't "deny our history," that we should "get over this politically correct phase we seem to be going to," and perhaps most importantly, that he's "not racist at all." Sordid colonial history shouldn't be taboo, yes. And yet there is something flippant about this—perhaps it's the original post's admission that it was boredom, perhaps it's the chipper aura of The Sims, perhaps it's my personal cynicism, perhaps it's that this wasn't initially created with the intent to unsettle and to create a conversation. Many things feel off about this to me. If there's something uncomfortable about this it's that I feel a sense of sanitation from the project. Though it's unclear if that's actually just a photoshop, nor is it clear that BourgeoisBanana actually took inspiration from that thread. We are investigating further and will update if anything new comes up.